A few weeks ago, I addressed the Great Garbage Bowl Debate, so when I ran across an article where yet another journalist decided to show us that Rachael's meals can't be made in 30 minutes, I thought it would be appropriate to discuss the Great 30 Minute Debate. The Daily Herald's Laura Bianchi decided to test several of Rachael Ray's recipes from both 30 Minute Meals 2 and Just in Time to see if they could be made in 30 minutes or less. 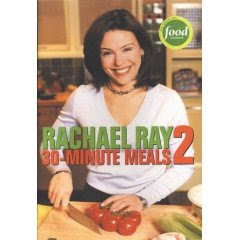 Let me first say this - why the obsession that Rachael Ray's meals come in under 30 minutes? The way that journalists love to test her meals, you would think that every cookbook came with a money back guarantee if dinner took 31 minutes to make instead of 30. I've always thought the 30-minute meal thing was slang for quick and easy recipes. I consider a meal with an entree and sides made in 30-45 minutes to be quick and easy. Do I prefer a meal that takes 30 minutes? Yes. Do I pick meals that I know I can't prepare in 30-45? No (except on the weekends). What really drives me bonkers is the logic that because Bianchi goes through a cookbook and feels "a mischievous glee in choosing recipes that looked like they didn't have a prayer of being finished on time," then all of Rachael Ray's recipes are some sort of hoax. How about next time, I pick the meals that are tested and pick all the ones that we know can be made in 30 minutes? Does the same principle apply so that we can conclude all of Rachael's meals can be made in 30 minutes? I guess that wouldn't sell newspapers. Do me a favor, journalists of the world, look through the recipes on this site and tell me if it was a better idea for me to cook those healthy and interesting recipes using fresh produce in about 30-45 minutes or whether it would be a better idea for me to spend 15 minutes to hit the Golden Arches like I used to. Stop discouraging people from making recipes that are quick and easy because you don't like Rachael Ray. Still, this vegetarian dish tastes great, and here's where Rachael is absolutely correct: A lot of her recipes are -- cringe -- "yum-o." She consistently chooses bold ingredients that build flavor quickly. Among them: fire-roasted tomatoes, earthy mushrooms, cumin, coriander and hot seasonings like chili powder, jalapeno and salsas. She squeezes in fresh lime or lemon juice, shreds in pepper jack cheese and sprinkles on scallions. Another plus: because she repeats ingredients throughout the book you can always find another use for the rest of your cilantro, white cheddar cheese or bottle of coriander. Beyond that, her recipes are easy to read -- ingredients are in bold face -- and instructions are generally easy to follow. "[Y]ou'll notice she never washes any of her produce or meat before using ingredients." Rachael consistently recommends washing all produce when you bring it home from the grocery store (except for berries). This is exactly why. It saves a ton of time to have them all ready to go in the fridge. "Pots, pans and tools are magically at hand -- I have to dig through a jumbled utensil drawer for my zester . . . ." Setting aside the fact that it's not Rachael's fault you have a disorganized kitchen, it's important to note that Rachael hates gadgets. She hardly uses any of them for just this reason - they junk up your drawers. The most complicated kitchen tool she uses is a food processor and she was even hesitant to do that. Clean out your drawers, it will save you time. "[A]nd she has the recipes memorized. No, she doesn't just have them memorized. She wrote them. And how much time do you spend reading the recipe while cooking? I read it through when I get started, then refer back to it now and then. And, of course, the more I make a recipe the faster it goes. Bianchi closes by saying: "Give yourself twice as long as the estimated time, then relax and enjoy the experience. You're in for some great eating." Again, even if it took an hour to make a recipe by Rachael Ray (which is an anomaly instead of the norm, for me at least), it would still be worth it. A full dinner on the table in 60 minutes, even with washing all the veggies and not being familiar with the recipe? Certainly better than a two cheeseburger meal with fries, huh? Ugh!! I don't get why people have to bash her all the time. I learned to cook from Rachael and can certainly pull off a 30 minute meal. Like you said, wash produce when you come home from the store (BIG timesaver), keep your garbage bowl handy (avoids wasted time walking back and forth to trash) and don't junk up your drawers. I have one great knife that I use for everything. Also, multi tasking is a great tip. While the water is boiling for your pasta, you can heat up a pan and chop veggies all in one step. Sorry for such a long comment but I just get irked by articles like this sometimes. Oh and congrats on your baby!! I agree, enough with "testing" to see if her recipes come in at the 30 minute mark. Of course, she can do it in 30 because she has made them a countless number of times... and, I know after I make one of her recipes (or anyone else's for that matter), it gets faster because I don't have to keep looking at the recipe while I cook. They really need to take a step back and accept that the general population does want these quick and easy recipes that can be made on a weeknight... we aren't all chefs and we want to feed our families well-rounded meals after a long day. I just started cooking RR's recipes a little over a month ago and have loved every one. Yes, most take me 45 minutes but I don't mind at all. I knew I wouldn't be able to do them in 30. She is prepared, 'knows' what she's doing, and doesn't have to read the recipe over and over like I do. That's a ridiculous article. Some journalists are such tools. It all comes down to your prep abilities. If you're well organized and fast with a knife then you're golden. If you're a little slower, than it takes more time. Anyway, I've tagged you for the ever popular "5 Things Meme." So I guess "Your it" now. you know, I never understood the whole issue with whether or not the recipes take 30 minutes, 40 minutes, whatever. the point of cooking it seems to me, is that you enjoy doing it. when i cook, no matter whose recipe it is, or what it is, it always takes me about an hour. no matter what. and that's perfectly fine with me. Thank you for the affirmation, everyone. I was wondering if maybe it was just me that got annoyed by these articles. Nothing against RR but she does cook on a TV set and has many different assistants and a TelePrompter to help her see her recipes and what to do next. There are "swap-outs" available to her during each commercial break. She does not cook in our "real world" but none of this means that we CAN"T cook her recipes in 30 minutes. But please don't measure your kitchen and cooking skills by her TV performance.